Our beautiful, marble topped, Victorian dresser. This was in Miss Bee’s old room. 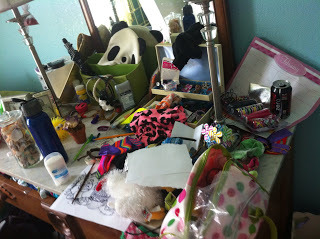 Before we made the switch this summer to her new, improved, kickin’ it teen-style room. We have now passed a law that dressers are not allowed in The Hive. So, help, me. Instead, she has Elfa in the closet to store all her belongings. 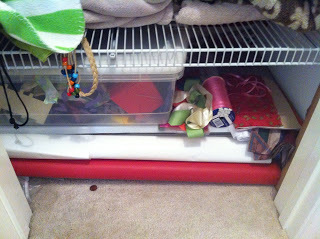 Once I cleared off all the stuff (this was a half-day affair) I got to thinking that this would make a perfect place for all my gift wrapping supplies! I. Am. A. Genious! Gift wrapping was stored all over my house. Some in the hall closet that is just supposed to be for linens. Some in the attic stuffed in a box that I had no idea what I had. And random ribbons from floral arrangements were stuffed in a kitchen drawer. 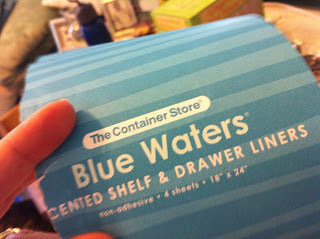 First, I vacuumed out the drawers, then lined them with scented paper from The Container Store. 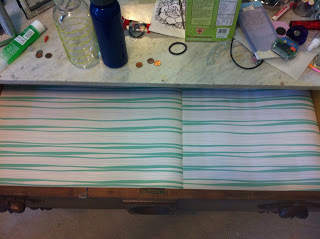 The four sheets that come in a roll, fit the drawer perfectly. No cutting necessary. 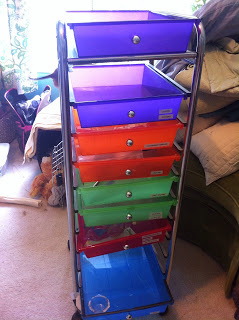 Then, I took a rickety drawer organizer that never worked properly and repurposed the drawers as dividers in each of the drawers of the dresser. This one for cellophane and other little small gift bags..
One thing I did to help organize the gift bags was to take adjustable tension rods and place them in the bottom drawer so I could “file” the bags to keep them side by side. This helps me to see what I have. The bags on the right side were too long to file, so I just stacked them. After this exercise I learned what I had, what I don’t need anymore off (tissue paper) and what I could probably use…rolls of solid wired ribbon. Now when I go into my craft room, I can easily wrap a gift without searching for things all over my house. I’ll show you more of my “Honeycomb Hideout” over the next few weeks.